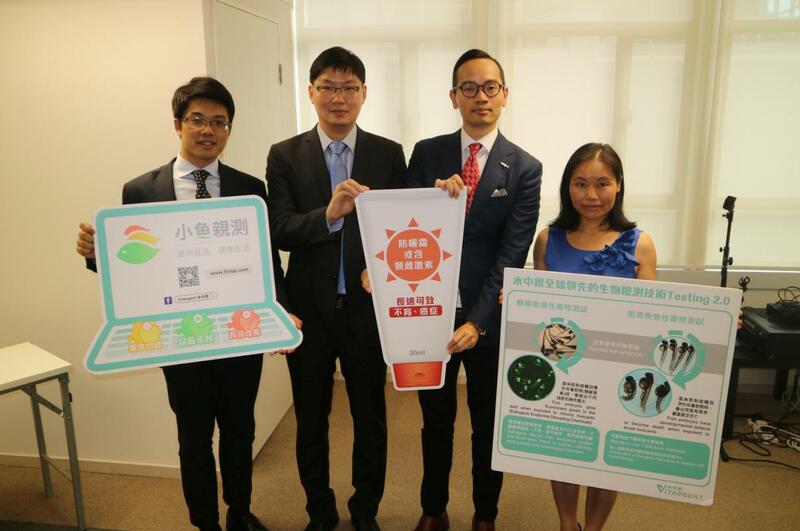 (Hong Kong, 17 August 2017) Vitargent (International) Biotechnology Limited (“Vitargent”) published the test results of 51 popular sunscreen products on the Test-it™ platform (www.fishqc.com). Known for its safety examination of cooking oil, BB cream and instant coffee, Vitargent investigated sun cream samples with the world-exclusive “transgenic medaka” and “zebrafish” embryo toxicity testing technology that was developed by Hong Kong scientists. The safety test rated 16 samples as Green Fish (excellent), eight samples as Yellow Fish (basic) and 27 samples as Red Fish (sub-optimal), while identified over 20 types of estrogenic endocrine disruptors (EEDs) in the sunscreen samples. The study discovered that the level of EEDs in 18 samples exceeds Vitargent’s safety standards. Meanwhile, four samples with particularly high EED concentration were found to contain as much EEDs per gram as contraceptive pills. The test also concluded that sunscreen products with active physical ingredients are safer than those with active chemical and hybrid ingredients. In view of this, Vitargent advised consumers to pay attention when making decisions. To block UV radiation on a scorching summer day, people put on sunscreen no matter they are indoor or outdoor. With overwhelming choices of sun cream products in the market, consumers not only consider their brand preference, skin type and complexion, but also pay attention to the products’ SPF and their ability to meet different needs, such as whitening, protection against skin darkening, moisturising, repairing, concealing and waterproof qualities. As a result, they may overlook the extra features and chemicals contained in the products. Vitargent purchased 51 sun cream products from beauty halls, Watson’s and online shopping platforms such as Kaola.com, Jingdong and Tmall and put them to the fish embryo toxicity test. Its samples came from 37 world-famous brands like Biotherm, Innisfree, Sunplay and Anessa. In the past few months, Vitargent performed tests on sunscreen samples by adopting the Testing 2.0 technology, which is a patented fish embryo bio-testing technology. Under which, samples are categorised as Green Fish, Yellow Fish and Red Fish according to product safety. The test result is also published on the online consumer product safety information platform, Test-it™, for consumers to identify safe products sold by retailers. Unlike traditional chemical testing methods, Vitargent’s biological testing technology enables the screening of “cocktail effect” caused by mixing over 1,000 toxicants and chemicals within 48 hours. The technology covers chemicals that are not included in the routine test. The zebrafish embryos used in acute toxicity testing of sunscreen have analogues of 84% of genes associated with human diseases, hence substances that are toxic to zebrafish embryos are likely to be toxic to human. For the testing of chronic toxicants (EEDs) in sunscreen, as the livers of medaka embryos used in the test emit green fluorescent light in the presence of harmful substances, the intensity of the fluorescence can be used to quantify the toxic chemicals. Test-it™ rated 16 out of 51 sunscreen samples as Green Fish (Excellent), eight as Yellow Fish (Basic) and 27 as Red Fish (Sub-Optimal). The average price of the 51 samples purchased is 5HKD/ml. The most expensive sample costs 20.6HKD/ml, which is 52 times of the cheapest one which costs 0.4HKD/ml. Among the samples that cost more than 4HKD/ml, only three samples (15%) were rated Green Fish and four (20%) were rated Yellow Fish, while 13 (65%) were rated Red Fish. All in all, most of the low-priced and high-priced sunscreens were not safe, with over half of the samples rated Red Fish. Therefore, consumers are advised to choose carefully. On the contrary, mid-priced samples had the best safety performance. In terms of product origin, Asian brands (from China, Taiwan, Japan and Korea) performed better than European and US brands (from France, Germany and the US) and Australian brands. More than 60% of the samples from Asia were rated Green Fish. (13 Green Fish (62%), four Yellow Fish (19%) and four Red Fish (19%)). Of which, 82% of the samples from Japanese brands were rated Green Fish. On the other hand, European and US brands and Australian brands had disappointing performance in general. Over 70% of samples from Europe and the US were rated Red Fish (three Green Fish (11%), four Yellow Fish (15%) and 20 Red Fish (74%)), while all three samples from Australia were rated Red Fish (100%). There are three main types of sun protection: through physical means, chemical means and a combination of both. Physical sunscreens work by forming a thin protective layer on the skin that blocks or reflects UV radiation, whereas chemical sunscreens absorb UV radiation with chemicals to neutralise and mitigate the direct damage to the skin, thereby achieving the desired effects. “Most of the sun cream products available in the market contain chemical ingredients that are colourless and odourless. As they leave no white cast on skin, the skin tone looks more natural. Nonetheless, our tests found that physical sun cream products are safer than chemical and hybrid ones, with four samples of physical sunscreen rated Green Fish (80%) and one rated Yellow Fish (20%), as compared to chemical sun cream of which two samples were rated Green Fish (11%) and 17 were rated Red Fish (89%), as well as hybrid sunscreen of which five samples were rated Green Fish (28%), four were rated Yellow Fish (22%) and nine were rated Red Fish (50%). Titanium dioxide and zinc oxide in physical sunblock are inorganic chemicals that are mild in nature and unlikely to cause irritation, hence suitable for sensitive skins and kids with delicate skins,” said Jimmy Tao. Dr. Chow reminded parents that some sunscreen for adults contains fragrances and preservatives that may lead to skin allergy and eczema. Therefore, parents should avoid putting such products on their kids, as they have delicate skin. Instead, they should select products with simple formulas that are specially designed for children. Besides, infants aged under six months shouldn’t use sun cream and should avoid direct sunlight. Dr. Chow also recommended applying sunscreen 30 minutes before going outdoor. Because Hong Kong is so humid, sun cream products can be washed away easily by sweat. Thus, people who are sweaty or participating in water sports should re-apply more frequently. However, they should not use sun cream excessively as this will clog pores. Sunscreen, no matter the SPF value, can only stay effective for two hours, so users should reapply to uncovered body parts every now and then. It is also recommended to drink more water after prolonged sun exposure to rehydrate, and use lotion to moisturise skin. Howe et al. The zebrafish reference genome sequence and its relationship to the human genome. Nature. (496-7446):498-503. The burning Facts. available at https://drive.google.com/drive/u/1/folders/0B1_f96X6Yt9ARnJRZjBkZGs5SE0. International Journal of Andrology. 2012, 35, 424-436.